Last week, President Trump announced new tariffs on steel and aluminum imports that have the potential to roil markets and impact trade relations with key allies and trading partners. The controversial tariffs, 25% on steel and 10% on aluminum, were formally approved on March 8 with few notable exceptions. President Trump justified the tariffs in the name of national security, leveraging an arcane trade law provision that has otherwise not been used in more than 30 years. By invoking the provision, the administration is attempting to circumvent World Trade Organization (WTO) rules while opening the door to using similar national security provisions on other ongoing issues such as China’s theft of US intellectual property. The steel and aluminum tariffs as currently announced, however, are more likely to impact other major US trading partners, particularly Canada and Mexico, although the administration has indicated that it would exempt both countries to the extent that an updated NAFTA agreement is reached. President Trump has also communicated potential exemption for military allies, highlighting the fluidity of the situation. Despite the controversy, there is historical precedent for steel import restrictions. In 1984, the Reagan administration restricted steel import trading rights via a series of bilateral trade agreements, and in 2002, the Bush administration imposed outright tariffs ranging from 8% to 30% on steel products. The Bush tariffs were ultimately withdrawn after an adverse WTO ruling and European Union (EU) retaliatory threats against US cars and Florida oranges. Although details are still forthcoming, if President Trump follows through on the tariffs as originally announced, they would be a boon for US steel and aluminum producers. Conversely, foreign producers stand to lose as they will see decreased demand from a key market (the US is currently the largest importer of steel and aluminum in the world). Domestic steel- and aluminum-consuming companies can also be negatively impacted by rising prices and decreased competition (see accompanying chart). An exception to this are those companies that can pass rising costs on to customers. 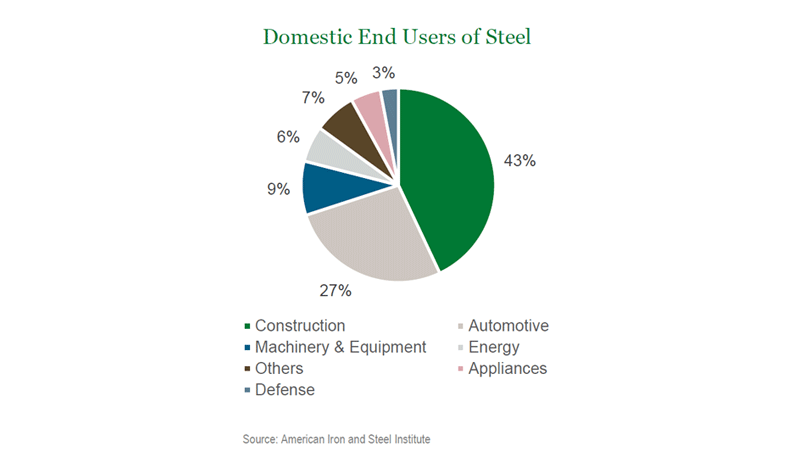 For example, domestic producers of specialized, niche products such as rebar, electric steel, engineered aluminum, and other energy related products may benefit even more than generic domestic producers as they can pass along higher metal costs to customers while also benefiting from rising prices and decreased competition. We see the tariffs having the potential to create winners and losers in the following industries, yet remain cognizant that as an active investment manager, it is important to monitor for risks of broader economic effects that are dependent on retaliatory measures imposed by other countries.